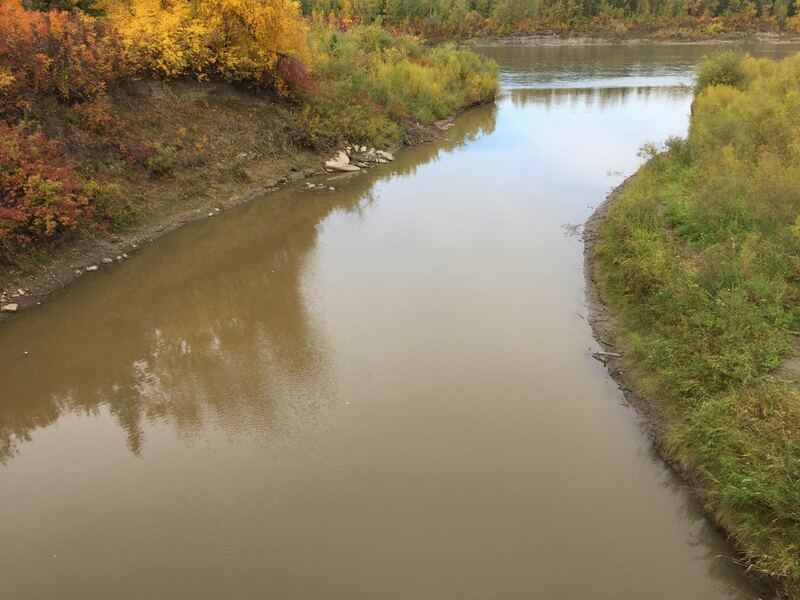 Is the North Saskatchewan River Dirty? Many people living in communities along the North Saskatchewan think that the river is dirty. When I first moved to Edmonton last November I saw the colour of the river and assumed the same thing. The river was covered with ice and snow, but instead of the typical bright white snow that you see elsewhere in the city, the snow on the river was brown. I assumed that the water wasn’t clean, and many people that I have spoken to make the same assumption. But just because water isn’t clear, that doesn’t mean that it isn’t clean. So what is the state of the water quality in the North Saskatchewan River? The birthplace of the North Saskatchewan River, also known as the headwaters, is the Saskatchewan Glacier in the Columbia Icefields. When I picture glacial waters, it makes me think of the pristine cloudy turquoise waters of Lake Louise or Moraine Lake, where I grew up visiting. Why is it that some bodies of water coming from glaciers look bright and colourful while others look brown? Rivers born from glaciers often have high levels of sediment and silt. Much of the colour of glacial lakes and rivers are due to erosion. This occurs when glaciers break down minerals from rock, forming sediment, which makes its way from the melting glaciers into lakes and rivers. Some lakes display dazzling colours as a result of this sediment. Sometimes in rivers, the colours are more of a muddy-brown because of the speed and flow of water. This does not mean that the river is dirtier than the lake. The colour depends on the types of minerals in the water, how they are moving, and how the light reflects off of the water. In glacial lakes, minerals are suspended and this causes light reflection, which often displays vibrant turquoise colours. This sediment appears differently in rivers, and while there are parts of the North Saskatchewan that are brilliant blue, it often appears brown because these sediments are constantly being stirred up. This sediment is also the reason that we have beaches that form across Edmonton, such as the Fort Edmonton Footbridge Beach, the Cloverdale Beach (aka Accidental Beach), and the Terwillegar Park Beach. Last summer, we tested these sites, among others, for water quality, and many of them passed over 50% of the time. The colour of a river does not necessarily indicate that it is clean or dirty. That being said, there are some potential threats to the water quality of the North Saskatchewan River. These threats include urban and agricultural runoff and combined sewer overflows which discharges pollutants into the river during periods of heavy rainfall. 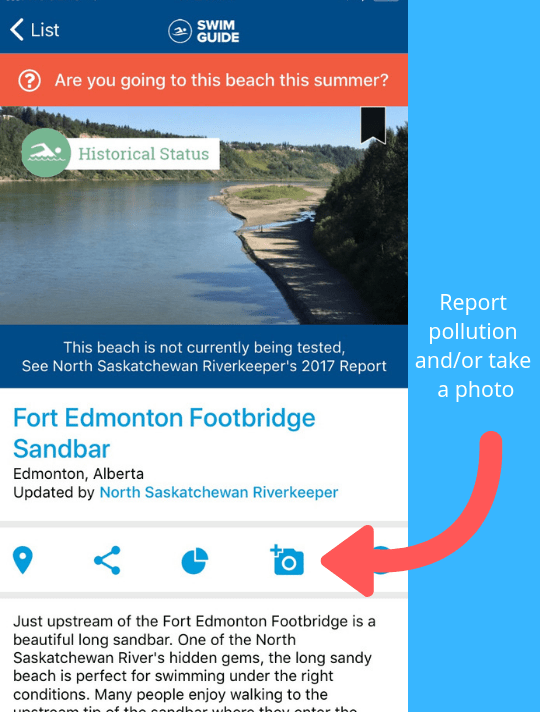 If you do ever see pollution such as trash or chemical spills, take a picture and report it on the Swim Guide app or website, or if you see an environmental emergency call the Alberta 24-hour Environment Toll-free Hotline at 1-800-222-6514. The waters of the North Saskatchewan River are not dirty! Even when the water isn’t perfectly clear, it’s often clean. There are a wide variety of activities that we can take advantage of right on the river, including swimming, stand up paddleboarding, canoeing, kayaking, fishing, jet boating, and even gold panning. Before getting into the water, it’s always a good idea to check for any recent water quality updates on theswimguide.org. The North Saskatchewan River is not dirty, and we should go out and take advantage of this beautiful body of water whenever possible! Misachi, John. “Why Are Glacial Lakes Blue?” World Atlas – Maps, Geography, Travel, WorldAtlas, 16 July 2018, www.worldatlas.com/articles/why-are-glacial-lakes-blue.html.